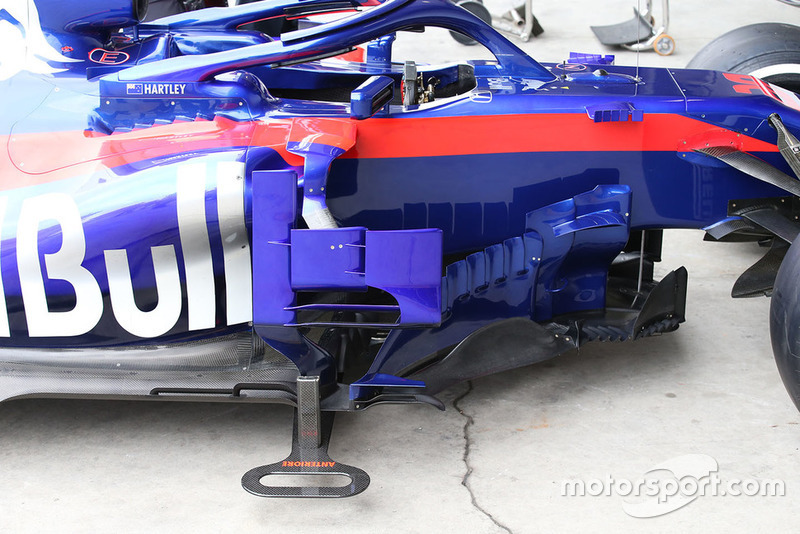 Introduced in the US as part of a package of new parts, these sidepod deflectors are now available to both Toro Rosso drivers. A great overview of the bargeboard region on the Haas VF-18, which has become ever more complex as the season has unfolded. 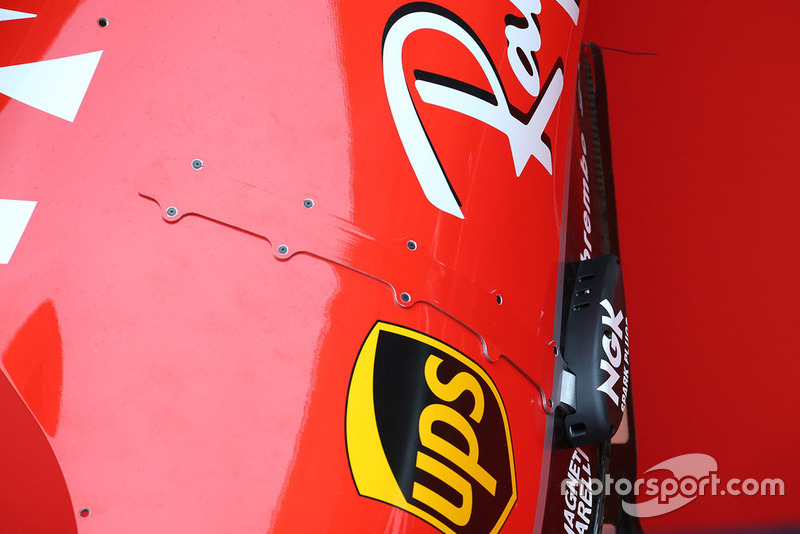 The Ferrari SF71H will be outfitted with sensor arrays during free practice as the sidepod is found with a teardrop-shaped bulge encasing some of the hardware, which itself is strapped to the side of the sidepod. 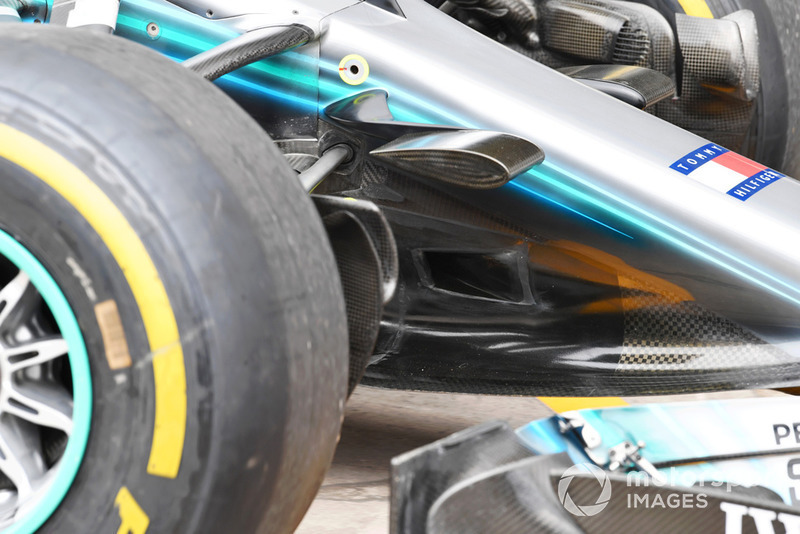 Note the heavy curvature that defines the two roles the wing plays, with the inboard flaps more or less responsible for generating downforce, while the outer section looks to alter the wake generated by the front tyre. The floor ahead of the rear tyre is always in a state of development flux, such is the crucial nature of how airflow is guided ahead of the tyre to influence the wake it creates. 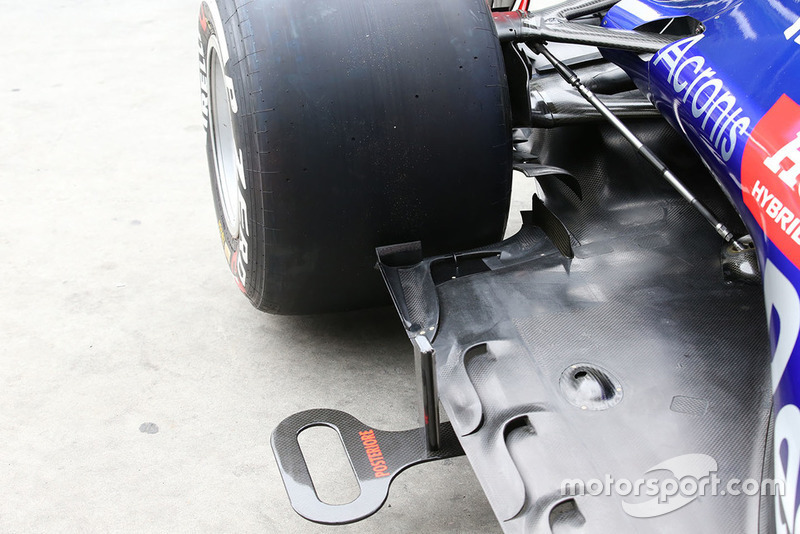 In Toro Rosso’s case, that development has led to the introduction of an L-shaped flap that stands proud of the floor. 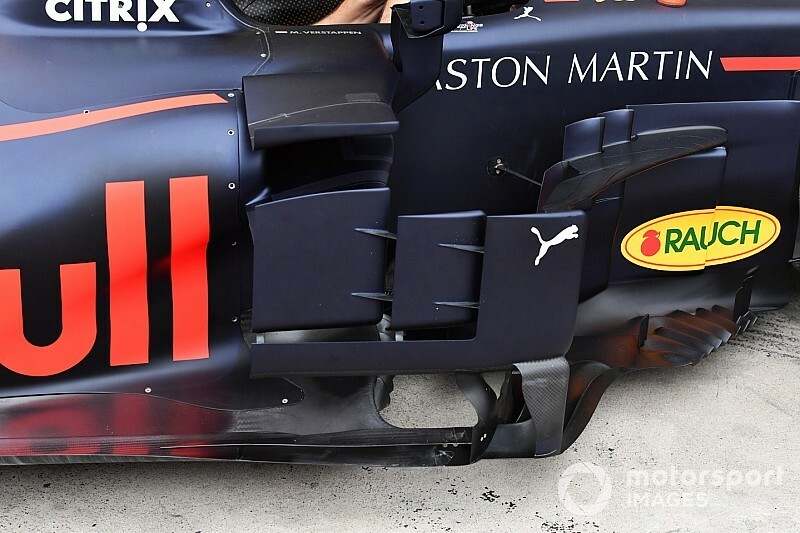 A close-up of the three-element sidepod deflectors used by Red Bull to guide the air along the car’s flanks. 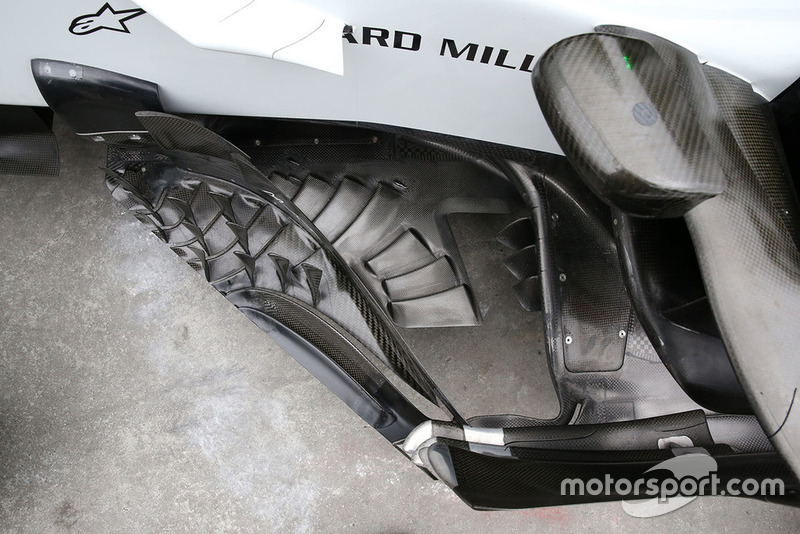 A close up of the Mercedes W09’s nose reveals the inlet that powers its ‘S’ duct solution. 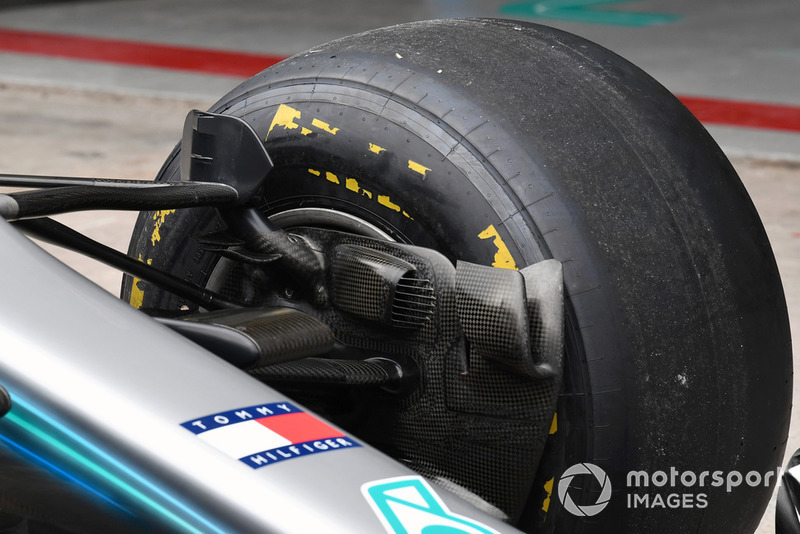 A look at the various flicks, fins and winglets placed upon the suspension and brake duct on the Mercedes W09, most of which won’t be possible from next year owing to the new regulations. 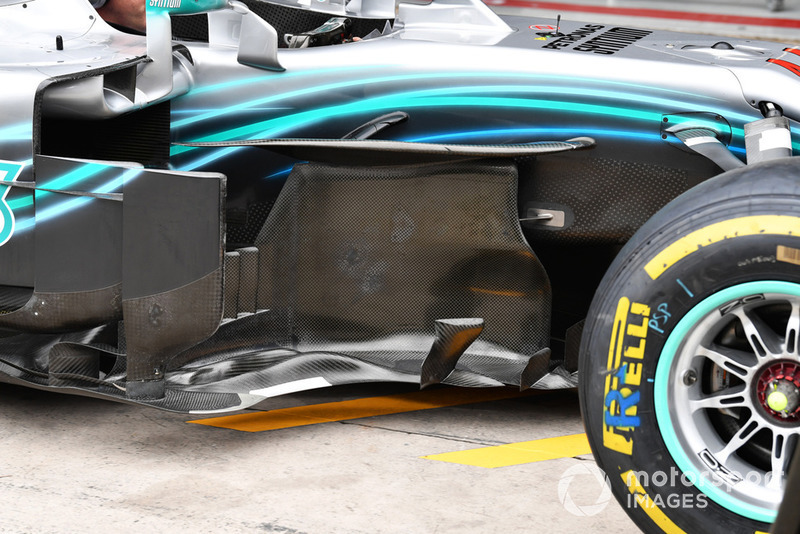 A look at the Mercedes W09’s front wing with its rather unusual endplate design, with a section at the rear that arches over to form another horizontal flap. 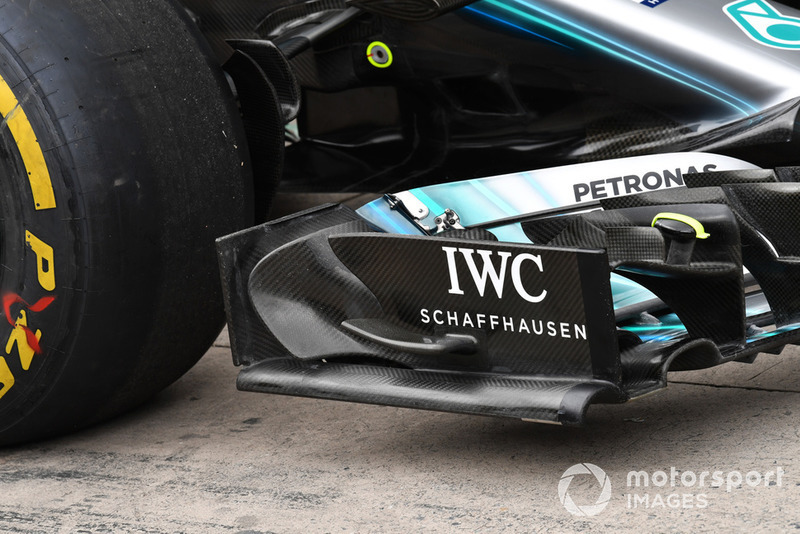 The bargeboard region on the Mercedes W09, which – unlike for most other cars on the grid – hasn’t been altered dramatically throughout the course of the season. 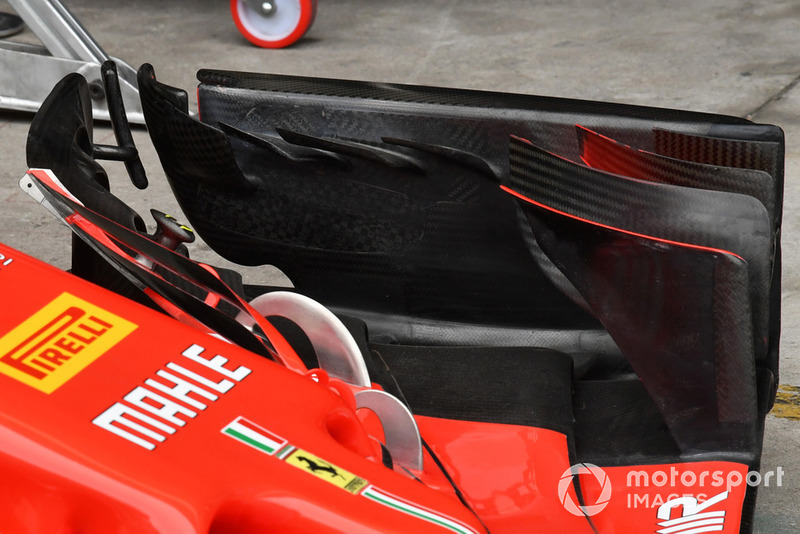 Ferrari’s front wing endplate, which has seen some some changes recently, including the inner canards that can be seen here. 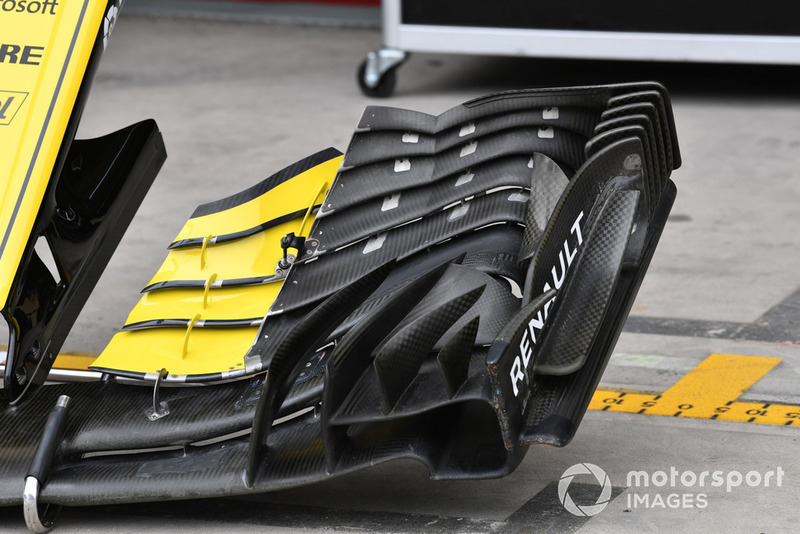 A close-up of Renault’s front wing, which features a rather novel more inwardly-placed adjuster that means less of the wing is affected when a change is made. 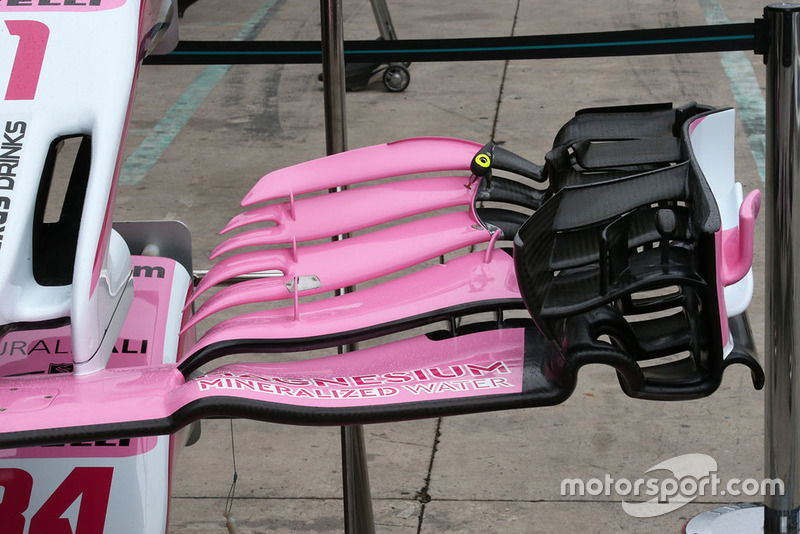 Also note the number outwardly outwashing endplate slots. 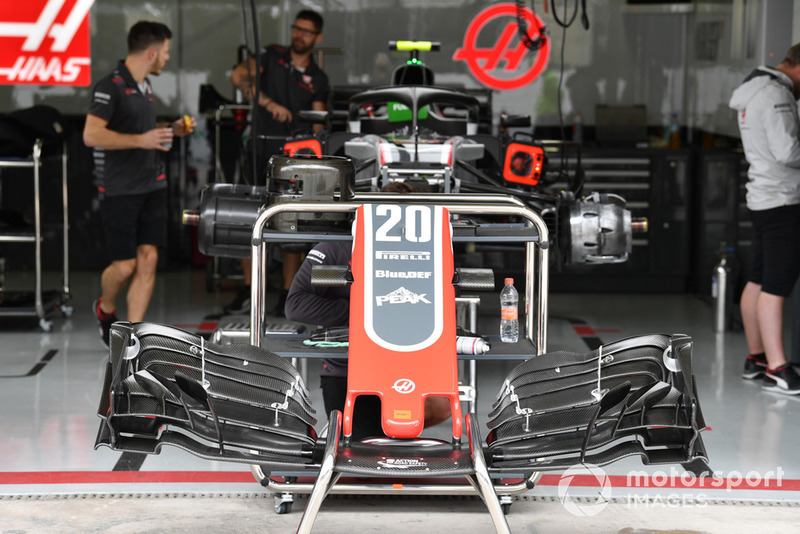 A nice overview of the front wing used by Haas, of which the squared-off flap tips are noteworthy, as is the use of asymmetric cooling layouts on the brake drums that can be seen in the background. 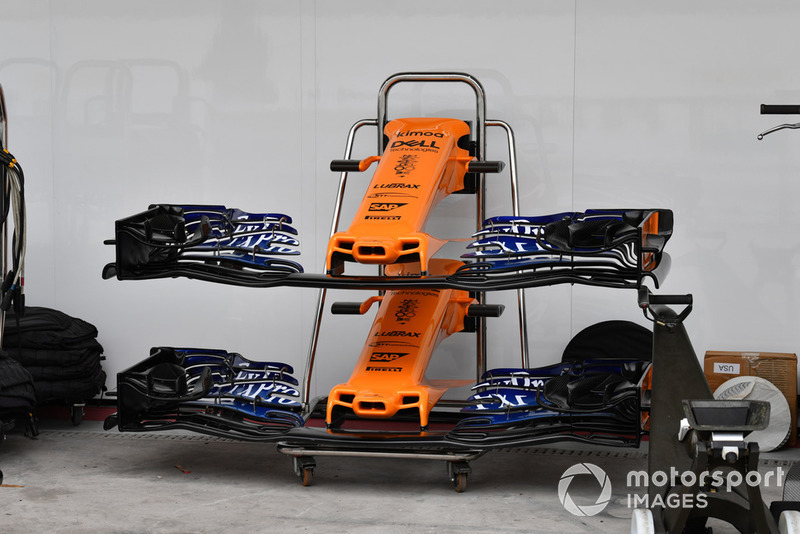 Note the slats that ran up the side of the McLaren nose have been discarded in recent races. Next Next post: Lamborghini Aventador SVJ à l’essai, elle se joue des contraintes de l’air !